At Ray Linge we specialise in stalls for operators to quickly and simply erect and dismantle. We make stalls to your own specification at very competitive prices. Below are a few examples of our stalls and prices. Telephone 01268 697780 for a quotation based on your own specifications. It is our aim to provide everything that a trader needs, below is an example of some of the items on sale. Stall Covers – Clear Side Sheets – Clips – Clip Covers – Stars and Cards – Marker Pens – Carrier Bags – Dress Rails – Round Rails – Rubber Stall Covers – Hanging Racks, Straight & Angled. If you have a large van and require it railed out, then book an appointment with us. It will take approx 4 hours to do. After that, you will be able to load and unload so much easier as well as carry twice as much stock. Alterations and repairs can be made to your stall at the factory while you wait. We specialise in stalls for operators quick and simple to erect and dismantle or stalls made to your own specification at a very competitive price. 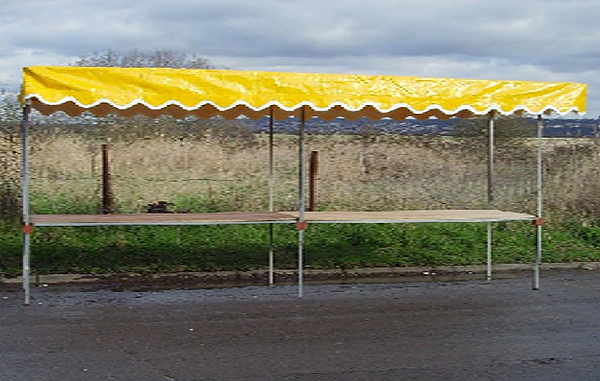 We also stock stalls for operators, charity organisations, Fetes, Town Shows and local Councils. Have your old stall resprayed and made to look like new, and save those rust marks spoiling your stock. You can have as many steps in the stand as you require. They can be free standing on the ground or standing on the table area of your stall giving maximum display effect.